We supply a huge variety of masks suitable for any occasion, from only 69p. Our ranges include Full Face, Venetian Style, Eyemasks, Animals, Character, Horror, and Halloween masks. We offer a next day and Saturday delivery service and the lowest prices online. 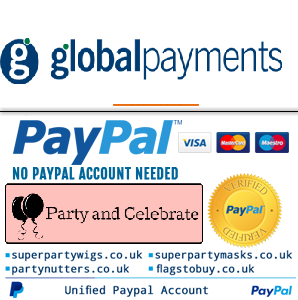 This site is owned and operated by Party Superstores Ltd. The company was started in 1994, has over 50 staff and a turnover of £3 million p.a. Party Superstores Ltd operates retail stores in the South London area with over 20,000 party products. For any queries or bulk orders, please contact us on between 9am - 5pm, Monday to Friday. Please Note: The Prices on this site are not available in our stores and they are not able to deal with any queries or orders regarding online purchases.